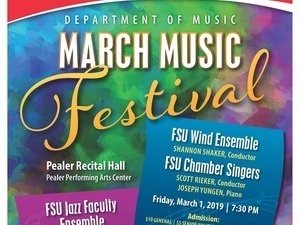 The Frostburg State University Department of Music will present the Wind Ensemble and Chamber Singers in concert on Friday, March 1, at 7:30 p.m. in the Pealer Recital Hall of FSU’s Woodward D. Pealer Performing Arts Center. Conducted by Shannon Shaker, the Wind Ensemble will perform a range of pieces, including “American Overture for Band” by Joseph Willcox Jenkins, “Flight of the Dragon” by Mollie Budiansky, “Forgotten Children” by Peter Meechan and “Vesuvius” by Frank Ticheli. With favorite themes of nature and aviation, Budiansky seeks to write music rooted in stories and sound worlds alike. “Flight of the Dragon” is a fanfare-like piece commissioned by the Sonoma Valley High School music department to celebrate the school’s 125th anniversary. “Vesuvius” began in the composer's mind as a wild and passionate dance such as might have been performed at an ancient Roman Bacchanalia. According to Ticheli, “As it grew more explosive and fiery, the piece evolved to become more like a dance from the final days of the doomed city of Pompeii, destroyed by Mt. Vesuvius in A.D. 79.” Indeed, the mountain is symbolized by the power and energy in this work. The FSU Chamber Singers, conducted by Scott Rieker and accompanied by pianist Joseph Yungen, will perform accompanied and a cappella works that showcase the emotional range of the human spirit, including two gems by Mexican composer Rodolfo Halfter and American composer Halsey Stevens, as well as a world premiere of a piece by Rieker. Admission is $10 for adults; $5 for seniors, members of the military and FSU faculty and staff, and free for all students and children 12 and younger. Tickets will be available at the door. Cash and credit cards are accepted.